Some products are appealing simply because they are available and convenient. Clean and Clear Advantage is convenient in a number of ways. Not only is it sold in drugstores and supermarkets, but it also comes inindividual products and in a kit, so you can replace the elements that you run out of easily. If Clean and Clear Advantage worth trying? Let’s find out. Clean and Clear is a well known brand of affordable skin care. The advantage line particular product uses the major active ingredient salicylic acid and 3 parts including a cleanser, a moisturizer, and a spot treatment. Acne Control Cleanser penetrates to the pores with acne-fighting Benzoyl Peroxide and keeps fighting breakouts long after you’ve washed your face. Fast Clearing Spot Treatment shows results in as little as 8 hours. It clears up pimples and helps prevent new ones from forming. Acne Control Moisturizer contains a breakthrough technology proven to dissolve oil fast, so serious acne medication can penetrate deep down to pores. You can generally find this product for about $20. 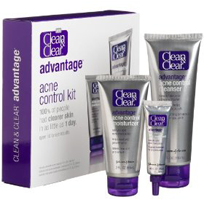 Clean and Clear Advantage compares itself to products such as Proactiv and claims to be better. They even claim that a study showed their product to produce results within the first day. However, we did not find any proof of that claim outside of their website. Besides that, there is nothing particularly special or revolutionary about this treatment. Just like any other cheap product, it is likely to dry out the skin, due in part to its use of benzoyl peroxide. And just like any other cheap product, its only substance is in one ingredient. Most people think they are saving money by buying a cheaper product. But in fact, you will spend more money buying all the cheap products because the last one didn’t work than you would just buying a reliable one in the first place.